The most important relationship advice you’ll get. 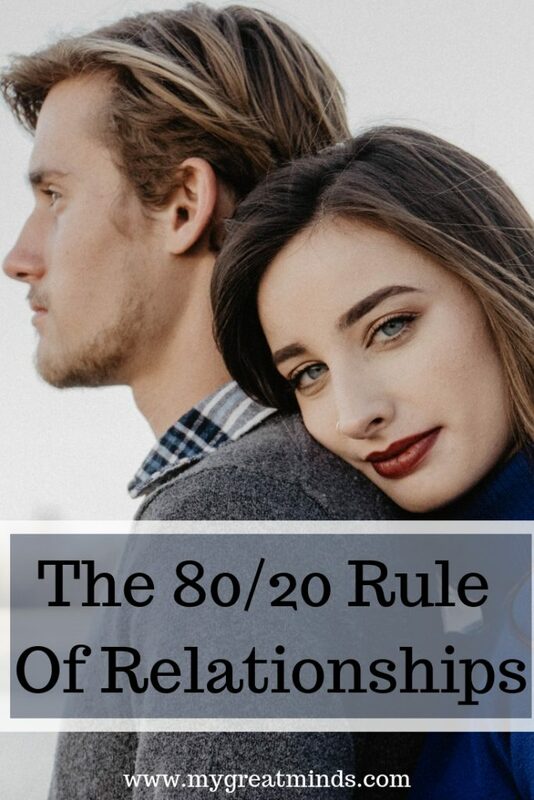 If you don’t know what the 80/20 rule is, you’ve already made your first mistake. This rule has made me revaluate all the relationships I have been in, as well as the ones I’ve considered beginning. We, as humans, are always looking for the next best thing because as we all know, the grass is always greener on the other side, right? Wrong. This is what the 80/20 rule teaches you. Generally, when in a relationship you get about 80 percent of what you want. This sounds pretty good because it’s such a high percentage. However, we are also craving that other 20 percent. We fight over it, break up over it and complain about it because as we already went over, we always want what we can’t have. Say your boyfriend or girlfriend is SO great—loyal, attentive, supportive, and caring. However, they aren’t as social as you. You always want to go out with friends, go to parties and hang in groups but they would rather hang out at home or Netflix and chill (and actually watch Netflix and actually chill). Instead of focusing on the 80 percent of things you want and are actually receiving, you focus on the 20 percent that shows your significant other being antisocial. Then comes the day you meet your 20 percent. They’re outgoing, always up to hang out, and never turns down an opportunity to party. They seem perfect. They are that 20 percent you are missing. So what do you do? You naturally think this person is a better match for you and so you break up with your current significant other for this person. This all seems perfect, now you have everything you want, right? Nope. You will soon realize even though you have that 20 percent, you ONLY have 20 percent. You no longer are getting 80 percent of what you want because you left that for the single aspect that you were missing to begin with. The 20 percent is dangled in front of your face looking like the ideal option, but you forget when you go after the one thing you were missing, you lose everything you had. You give up 80 percent happiness for only 20 percent. You gave up a caring, respectful, amazing partner for an obnoxious, drunk, party animal because it seemed like everything you wanted at the time. This rule may seem obvious, but next time you want to complain about your boyfriend or girlfriend, I bet you’ll think twice and remember the 80 percent that you get every day. Forget about the 20 percent that’s probably something insignificant anyway. Appreciate your loved one and always let them know it. Don’t get caught yearning over 20 percent.